The illustrations are so beautiful, yet “boyish” and the messages are so wise. My son has really enjoyed this book. 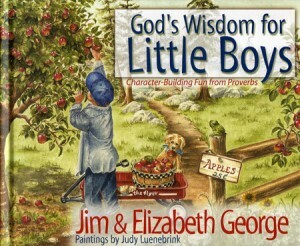 If you don’t have little boys, I believe there is a counterpart for little girls called “God’s Little Wisdom for Little Girls” that focuses on Proverbs 31. If it is anything at all like the version for boys, I’m sure it is wonderful. I really recommend you looking into these books if you have little ones. REMINDER: We are just one week away from “May”keover Month (our guest blog series that focuses on easy, practical ways caregivers can makeover their current shepherding routine). Make sure to check back with us in May!